It's good to be back again blogging. I was a bit busy a few days ago. So here's my first post for the week. I have decided to make a product review for all those kikay girls out there. 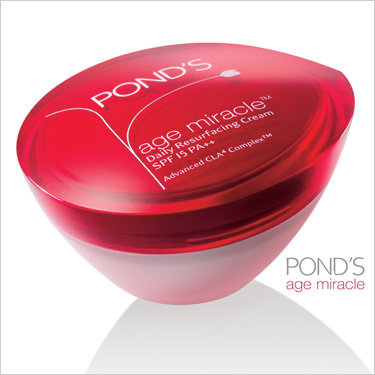 This day's product is Ponds Age Miracle Daily Resurfacing Cream. I have been a user of Ponds Product. I use their toner, their facial wash and their Daily Resurfacing Cream. First and foremost, Ponds Age Miracle Daily Resurfacing Cream is primarily for fighting aging, reducing wrinkles or age spots in 7 days. That's their promise! This Age Miracle cream is dubbed as Asia's cult cream. It is in fact the best seller beating many popular brands in the market. Price wise, this cream is very affordable at only 299 pesos. With the right usage, the product can be used for a month. I used the one in a jar , see photo above. Ponds Age Miracle Daily Resurfacing cream is not so sticky and it smells good. It is a great moisturizer considering how easily it would seem for the cream to get absorbed by the skin. It is also a great foundation for make ups because it leaves a matte polished finish, instantly reducing skin discolorations like acne marks. Yes it makes your skin whiter instantly. Another great thing about this product is the SPF 15, so you can actually go out in the sun without worrying about the damaging UV rays. I don't have many visible wrinkles on my face. So I can't tell with certainty that the cream removed my wrinkles. But as far as my friends who also used the same product are concerned, they noticed a huge difference on their faces. Wrinkles have been less visible and their pores have shrunk in size. In my case, I noticed my facial skin is tighter, pores are smaller and my skin is more radiant. I also did not develop any irritation in the form of rashes, acne or skin itching. The downside to using Ponds Age Miracle Daily Resurfacing Cream is that it seems there is no more effect after a month of usage. Perhaps I developed immunity to the product or perhaps the threshold has been reached. Either case, I am not going to buy the product again for purposes of fighting aging. But as a moisturizer it is a great choice!